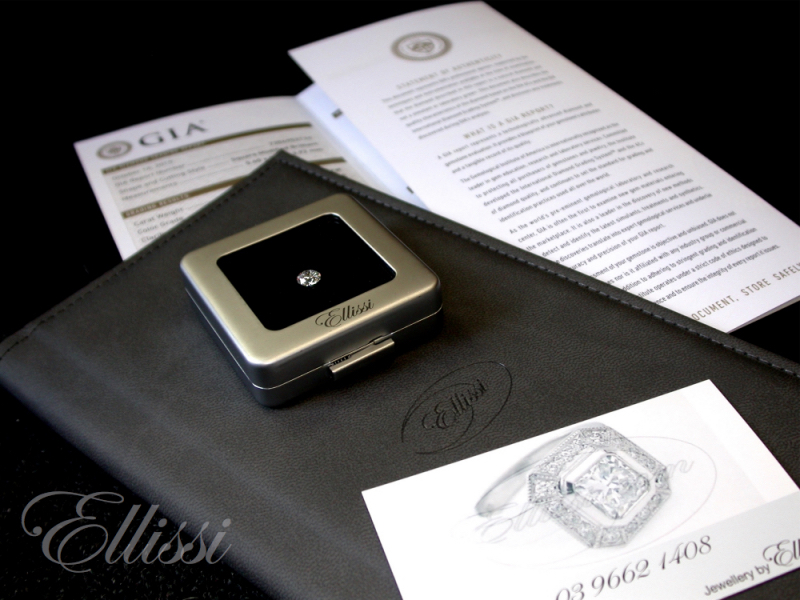 At Ellissi, we recommend GIA certified diamonds. These are diamonds that have been graded by the Gemological Institute of America (GIA) and have a certificate to demonstrate the diamond’s grade. The GIA is considered one of the most consistently accurate labs for diamond grading. However, it should be noted, just because a diamond has been graded by the GIA, it does not mean that it is a good diamond. It simply means the diamond has been assessed and graded. To understand how good (or bad), a diamond is, we need far more info than is provided in the certificate. In fact the GIA cert is a very basic document particularly in the subjective areas of colour and clarity. A GIA certified diamond is a starting point for our investigations. There are other measures that we need to look at before we can make a decision about any particular diamond. Individual diamonds need to be assessed in greater detail, in order to understand what the diamond’s performance will be. Additional areas well beyond “The 4 c’s” need to be assessed. When it comes to choosing the diamond grade, your budget is usually the key determining factor. Although quite a few things need to be considered before arriving at a final decision. The very best diamond grades will of course generally be the most costly, i.e D/IF (D colour and Internally Flawless). However, with a sensible approach, a nice balance can be achieved, hopefully without selling your soul and the box it came in. I am a great believer in paying for what you can see when it comes to diamonds. To my way of thinking, there is little point in paying for things that will make no visible difference to the diamond. If you want a white diamond, you should keep the colour in the top 4 colour grades of (D/E/F/G). In the modern era of diamond shapes, Cut, Polish and Symmetry should all be at the top end of the scale to get the most out of the diamond crystal’s reflective qualities. The best diamonds in that case are graded at “EX” to “VG” (Excellent / Very good) by the GIA. Old cuts like “Mine” and “Antique brilliant” generally can’t be judged by GIA standards, as their beauty to a large extent is in the fact that they are not perfect. Are GIA Certified Diamonds More Expensive? Before deciding on any of the above 4 c’s and beyond. The diamond grades and in particular, the certification basis should always be understood. You cannot judge what the true grade, and therefore value is, if you don’t know for example, that grades are not equal from Lab to Lab. If you remember nothing else from this site, make sure you absorb this one thing. It is perhaps the most important part of the equation at the start. Some people think GIA certified diamonds are expensive, when compared to certified diamonds from other labs. On the surface, this may appear to be so. However, what they have failed to understand is that you cannot look at a certificate from the GIA and match it with a certificate from, say the EGL. You may think that you are comparing apples with apples and for example, D colour is D colour regardless of the lab. Just because both certificates say “D” it does not mean that both diamonds are in fact the same grade. Confused? Well, the terminology used by both labs is the same. However, the grading standards and rules used are different. Think of it like buying a paint colour. Where would you say white paint stops being white? Maybe another person would say you are allowing too much tint in your white grade before you call it off white. So it can be with GIA diamonds measured against others. The price, hopefully reflects this issue, but you will need to decide that. Diamond Grades and GIA Certified Diamonds: Getting a good diamond. Many people ask me to “ﬁnd them a good diamond” which is, of course my job, but what is a good diamond? It depends on so many things. One person’s diamond option will not suit the next. In the end its about working out which parts of the standards are the most important to you. Then deciding what is a nice balance in size and quality and putting it in a design you can afford. At the end of the day what you want is a ring that shows all the best qualities you have worked hard to get right. It needs to be in budget too, of course. It is difficult for a person, without training, to know if a diamond is good or bad without certification. However, it is extremely unwise to rely only on a diamond’s certification. The report produced by the GIA may be the best standard we have, but it is still only the starting point. For more information on this take a look at diamond certification. Some people think they are diamond experts after surfing the web for a few hours… it really is not that simple! It is very important to have a good understanding of the issues, and seek professional advice.